If you’re looking for the easiest turkey dinner ever, look no further. This meal tastes like you slaved over the stove for hours, but really, it’s easier than you think. Either a day ahead of time, or the morning of, you do put in a little bit of time and effort. 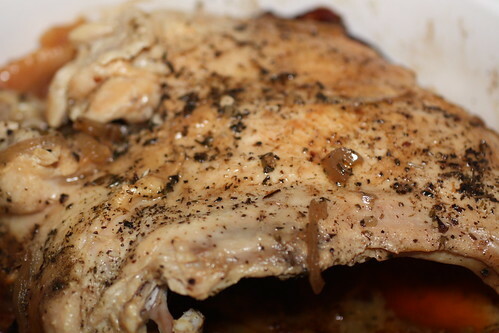 I like to brown turkey and make a bit of a pan sauce to help flavor the bird, but if you’re crunched for time, you could skip this step (I haven’t done this, so I can’t vouch for it still having that ‘roasted’ turkey scent and flavor then). To me, it’s worth the little bit of extra effort and dish washing. My favorite cooking booze by far is brandy (well, spiced rum is a close second). The scent of onions cooking away, combined with the brandy and butter had me wanting to eat the pan sauce for breakfast the day I made the turkey. However, I held back, mostly because those are too strong of flavors in the morning for me. The trickiest part about this recipe is buying a turkey breast that will fit into your slow cooker. My limit seems to be about a six pound bird; any larger, and the top won’t fit snugly. Granted, once the bird starts cooking, it will shrink a bit, and the cover will likely fit. I’d take the chance, but you may not be comfortable doing so. 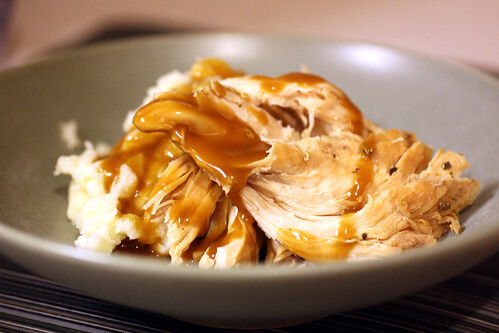 What fun is a turkey dinner without the mashed potatoes and gravy? Well, at least for the first night. 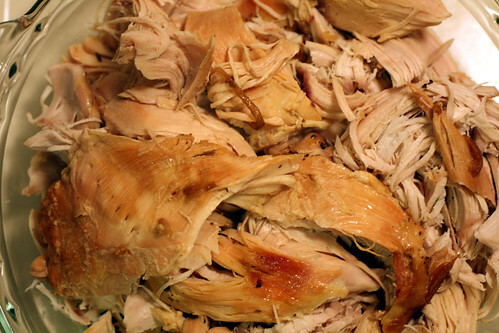 After that, you can have all sorts of fun making turkey sandwiches, turkey soup… The one unfortunate part of this recipe is that the carcass tends to fall apart, so making chicken stock can be a bit more difficult. Not impossible, if you reserve the bones, just more difficult. If you want turkey soup, though, I highly recommend you hang onto the bones (and skin!) so you can make soup stock. I have to confess, since I started making turkey breast this way, turkey is no longer confined to just the holidays for me. I probably should stop, to keep turkey special, but when you look at the price of a turkey breast, and compare it to deli meat, you’re saving a TON of money by making the turkey yourself. Usually, I’d add that this way, you can also control the ingredients, but since I cheated and used the included gravy packet – hey, it was late, and I was tired – I’ll refrain from making that particular comment this time. But really, the gravy packet is so salty, and there are some scary ingredients, so you may want to whip up gravy on your own. If you use the roux method, it’s really pretty easy. Spray the insert of your slow cooker with cooking spray. Heat a generous splash of olive oil in a large skillet (avoid nonstick if possible) over medium to medium high heat. 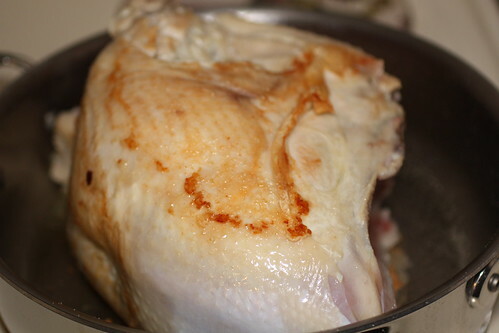 Place the turkey in the skillet and allow to brown (give it several minutes before checking – if it seems to be sticking to the pan, let it alone for a few more minutes). While browning, sprinkle the bird generously with salt and pepper, inside and out. With a large tongs, flip the turkey over and continue browning as many sides as you’re able to, holding the bird in place with your tongs if necessary. Season with more salt and pepper while browning. Carefully transfer the bird to the slow cooker (it’s easier if you remove the insert and place it next to the skillet) with the tongs. 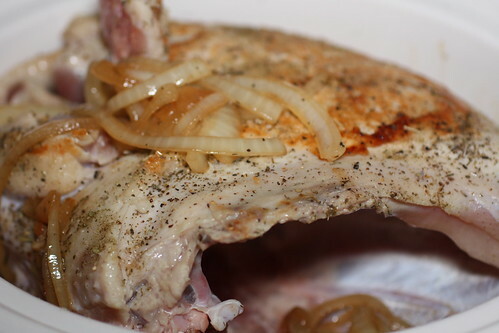 Sprinkle the bird with herbs de provence or poultry seasoning, if desired. Add a little more oil to the skillet if needed. Add sliced onions and cook to soften and/or brown, if desired. 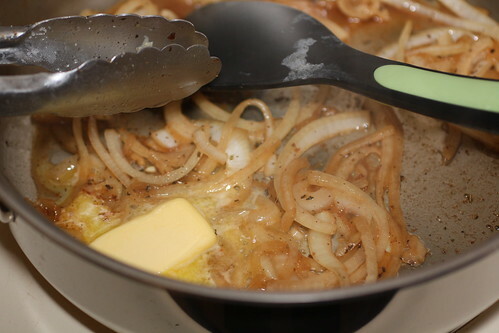 When the onions are soft, add a generous splash of brandy to the pan (off heat, especially if using a gas stove). Using a wooden spoon or silicone cooking utensil, scrape up any remaining brown bits on the bottom of the pan. Add the butter and allow to melt; transfer contents to slow cooker. If desired, serve with mashed potatoes and gravy. I need to preface this by saying, this really isn’t a recipe, it’s simply how I make potatoes. 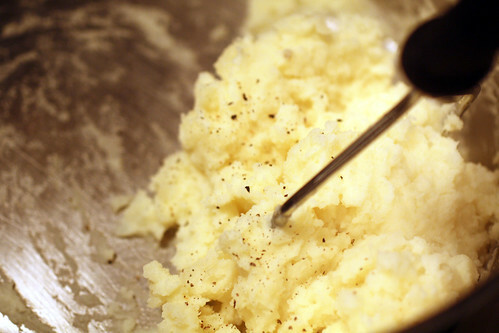 You will not see me using a ricer or food mill for my potatoes – I use a potato masher. I also don’t care if there’s a lump or two. I’m not a chef, and frankly, I don’t want my potatoes tasting like a chef made them – I want them to taste like home cooking. Add a splash of olive oil to the water and a generous sprinkle of salt. Bring potatoes to a boil over medium-high to high heat and boil uncovered until potatoes are fork tender. Drain, reserving pot. Add a pat of butter per potato to the pot and allow to melt via carry-over heat. Return drained potatoes to the pan and start to mash. Add milk/half and half until desired consistency is reached. Season with additional salt and pepper as desired. 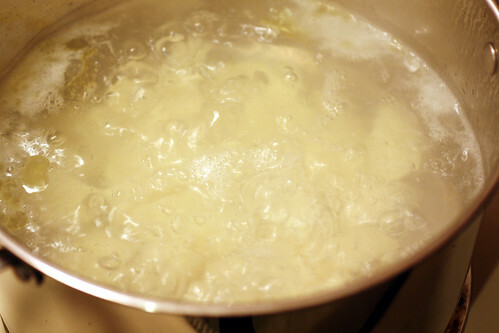 Heat butter or drippings over medium heat. Whisk in flour until it smells slightly nutty. Slowly whisk in stock while continuously whisking until thickened. Season with salt and pepper as needed. Heat over very low until ready to serve. I’m sold! I never ever think to make turkey outside of t-giving, but you’ve convinced me! Can’t wait to try this – maybe even as soon as tomorrow! Oh, you’re making me so hungry. Turkey and gravy is one of my favorites. i can’t say turkey is my favourite meat, but your pictures are really making me hungry! Leah, I imagine it would be the perfect accompaniment to this snowstorm we’re being walloped by this week! Michelle, I love it too, but I really need to stop making it, or it will lose that “special” meal atmosphere. LimeCake, even though turkey isn’t your favorite, I’m glad you still enjoyed the post. 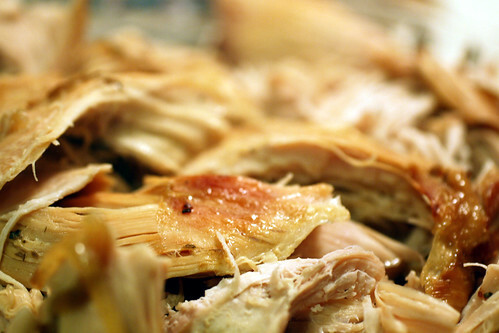 Dear Sara – Hi and a great recipe for an easy, healthy way to cook turkey! I am sorry to say, though because i just got settled in to my new place in Meaford, Ontario, there isn’t room on my kitchen counter for me to have a slow cooker, as much as i would like to try using one! Could you possibly revise your recipe for the oven? thank you, sincerely, Lisa.